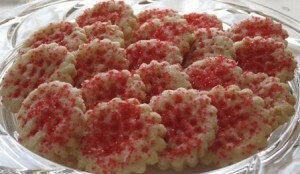 My next few posts will include the cookie recipes I have introduced to you in my Christmas cookie post. I am starting with my most favorite cookies, the Cream Wafers. If you read the ingredients, you might not be able to envision how decadent these really are. They are very light and flaky, resemble a puff pastry, and practically melt in your mouth. For your convenience, I am also including pictures of the final step by step preparation instructions, which are very important for a successful outcome of this product. This recipe yields about 4-5 dozen of cookies. Cut out cookies are placed on plate filled with granulated sugar. Each cookie is pricked with a fork about 4 times, to let the steam out during baking, helping it to puff out). Cookies are all baked to a delicate flaky decadent morsels. They can be served plain, with sprinkles, or filled and formed into sandwich cookies. 1 ½ oz unsweetened baker’s chocolate, melted (I melt it in a microware for 1 ½ minutes, stirring halfway through). Combine butter and cream, and mix thoroughly. Flour your hands, and divide the dough into, an orange size, balls. Place balls in a bowl, cover, and chill in the refrigerator for a couple of hours, or overnight. Take out one ball at a time, and massage, by squishing it in your hands, for 8-10 seconds. Flatten the ball, place it on a floured work area, and roll out to 1/8 inch thickness. (Sprinkle the dough lightly with flour as you are rolling it out. But use flour sparingly as not to make the dough too dense, thus taking away from the flakiness of the cookies). Keep remaining dough balls in the fridge. 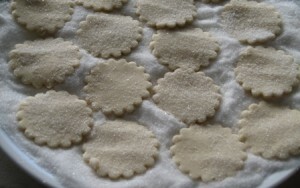 Using a cookie cutter, cut out 1½ inch cookies (I use a circular shape). Fill a dinner plate with granular sugar. Transfer the rounds into the sugar. Coat both sides of rounds with sugar, pressing them lightly with your fingers. Gather the remaining dough from your work area, form into a ball and follow the above process until all the dough is done. (I try to work with all the fresh dough balls first, as these make the best cookies. I keep the remnants of the dough from cut outs, in the fridge, until ready to use again. At the end, I combine all the dough remnants, form them into a ball and follow the rest of the rolling/cutting out process. These cookies will get denser with each roll out, as you are adding more flour during rolling. So use as little additional flour as possible). Remove and place on an ungreased cookie sheet. You do not need to spread these far apart, as they do not spread out, but rather puff out upwards. Prick each cookie, about 4 times, with a fork (it lets the steam out during baking, helping it to puff out). If you choose to sprinkle these with colored sugar, this is the time to do it. Place in a preheated oven at 375o for 7-9 minutes, or just until set, but not browned (these remain at a very light color, even after baking). Remove and cool on cookie racks. 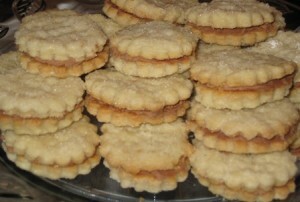 or make them into sandwich cookies, with the following filling (I love them the best with the chocolate filling). Cream all ingredients well, to spreading consistency. Add a drop of water, one at a time, if needed. Spread filling on the bottom side of each cookie, and cover it with another bottom side cookie (sandwich like). 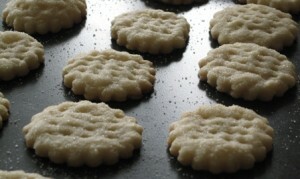 Thicker cookie rounds will need longer baking time, and will result in lesser total quantity. These are good, even without the cream center! You are right, but I like them with the cream filling. My son also prefers having them without the cream. These look soooooo good, can’t wait to try them when I get home!! Merry Christmas Suzy. Hopefully you and your family had an easy trip to visit your family for the Holidays. 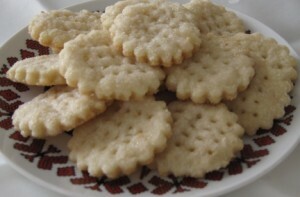 I know you will love these cookies, they really are wonderful. You will notice that I linked a couple of my cookie post to your website, as I used your recipes. You always manage to put a smile on my face. Now you know how I feel when I am making them, and taking numerous pictures before I settle on the best one. I am definitely detoxing my body after the holidays….I will share a post about it, but meanwhile stay put, since I have spent several hours today to get more cookie posts to publish before the New Year!! Mmm I love these cookies. They are a definite Christmas and special occasion staple! Yes, in my book all cookies around the Holidays are a staple food. These are more fun to make with a helping hand from a couple of “elfs” . These cookies are at their prime taste when fresh, but they are still very good after being frozen. 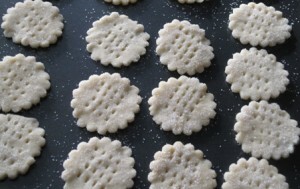 You can also freeze them without the filling, and fill them with fresh filling few days before use, once fully thawed. Instead of spreading the cookies with a cream could I spread with a jam? I absolutely love these cookies…may favorite.